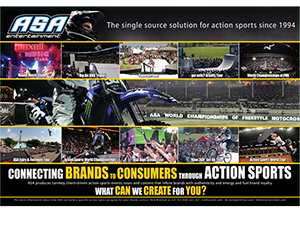 ASA Entertainment has been a leader in action sports event and television production since 1994. Our company develops, manages and executes over 125 events and television programs annually in skateboarding, BMX, snowboarding, surfing, freestyle motocross and music. Our events range from large-scale nationally televised pro competitions to smaller grassroots contests, exhibitions and mobile tours. We are currently seeking a dynamic sales representative to sell the company’s customized action sports events as well as book our events into schools. The person in this position must possess excellent research, communication, organizational and follow up skills as well as the ability to think on their feet. The ideal candidate would be a passionate, proactive, creative, hard-working self-starter with a minimum of 3 years sales experience. The position is based in Melbourne, FL and reports directly to senior management. ASA Entertainment has been an established industry leader for the past 24 years and offers a fast-paced work environment and competitive benefits package. Compensation for the Sales Representative offers salary and commission with unlimited earnings potential for successful individuals. Bachelor’s degree from a 4 year University and a minimum of 3 years of relevant sales experience is required. Please email a cover letter and resume to careers@ASAent.com or fax to (321) 722-9391.